Leeds Symphony Orchestra was founded in 1890, and we gave our first concert on 30th November 1891. 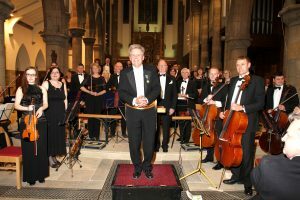 We have had a continuous existence since then, making us one of the oldest established amateur orchestras in the United Kingdom. For the first eighty years of the orchestra’s life, we had ten conductors, though four of these served only a year each during the First World War. Of these conductors, Harold Mason was in post for the longest, from 1920 – 1948. Our present conductor Martin Binks was appointed in 1970. We now give regular performances in Headingley, Horsforth, Wetherby and Knaresborough. For playing membe rs of LSO, a basic standard of Grade VIII is required. If you would like to audition, please contact us.